The Ministry of Justice and Prison Reforms has decided to conduct a special investigation into how the inmates from Angunukolapelessa got out of their cells. A special team is to be sent to Angunakolapelessa Prison regarding this, today (22). 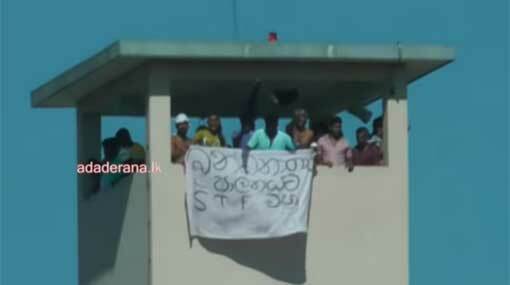 A group of inmates of the Angunukolapelessa Prison are engaged in a protest since yesterday (21) against the deployment of STF officers for the security of the prison. Firstly a group of 40 inmates had got on to the roof of an observation tower and then later, more inmates joined them. Reportedly, they continued their protest throughout the last night as well. Protestors are demanding the removal of the STF officers deployed to ensure the security of the prison. However, there is a question as to how they got out of their cells in the first place, stated a spokesperson of the Ministry of Justice and Prison Reforms. She says that they will check CCTV footage to see if this had received any assistance from the prison officials. STF had been deployed for the security of Angunakolapelessa Prison since Wednesday (17), where they inspect the security of the prison perimeters and the persons visiting the prison from the outside. It is reported that, during these search operations, 06 SIM cards have been found attempted to be taken inside the prison.